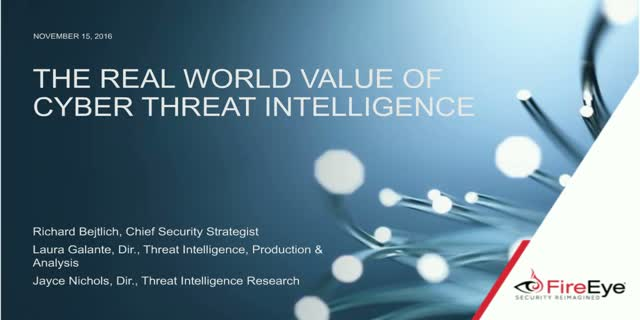 -What cyber threat intelligence truly is and the benefits of being intelligence-led. -How to tailor threat intelligence to your unique security mission. -How FireEye iSIGHT’s 160 security experts around the globe mobilize to transform raw information into finished actionable intelligence. Hunt advanced, tiered attacks lying in wait within your systems. Prioritize the most relevant threats amidst 1,000s of daily security alerts. Join us live and discover how savvy organizations operationalize intelligence up and down the organization to preempt attack, inform strategy and more. Laura Galante, Dir, Threat Intel Production/Analysis, FireEye. Jayce Nichols, Dir., Threat Intel Research, FireEye. Presented by: Laura Galante, Dir, Threat Intel Production/Analysis, FireEye. Jayce Nichols, Dir., Threat Intel Research, FireEye.